Atlus is expecting - or should we be expecting something? A mysterious Atlus teaser site has appeared, and it features ultrasound images. A link to the site was included in a recent Atlus newsletter about 2D fighting game Aquapazza. A small, vague thumbnail was posted at the very bottom of the newsletter, and clicking it leads to the strange website, complete with the sound of a steady heartbeat. 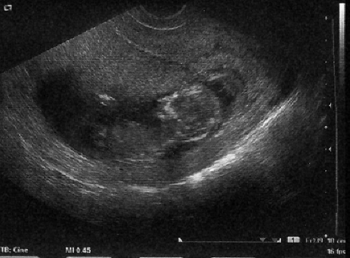 Some of the text to the left of the ultrasound pictures include "Persist 5," "Gold 4," and "Trial 2." Siliconera guesses that these could refer to a potential Persona 5 in the works, the already released Persona 4: Golden, and side-scrolling action platform and puzzle game Trine 2. Above "Trial 2" is "C2," which could stand for Japan-only RPG Conception II, and the small web format file is named "sc_c2.swf." Conception II has elements of a dating sim in that you make "Star Children" to fight monsters as different classes like swordsmen, magicians, and thieves. The main character, a teenage boy, bonds with different girls in the game to use a magic machine to make the Star Children. Atlus also has some Persona-related news to deliver in due time. A teaser page unveiled in September hinted at something being revealed on Nov. 24. This new teaser website is probably unrelated to Persona, but "Persist 5" could add some more weight to speculations of an official Persona 5 announcement. Or maybe this could be nothing. Either way, this ultrasound teaser is bizarre.